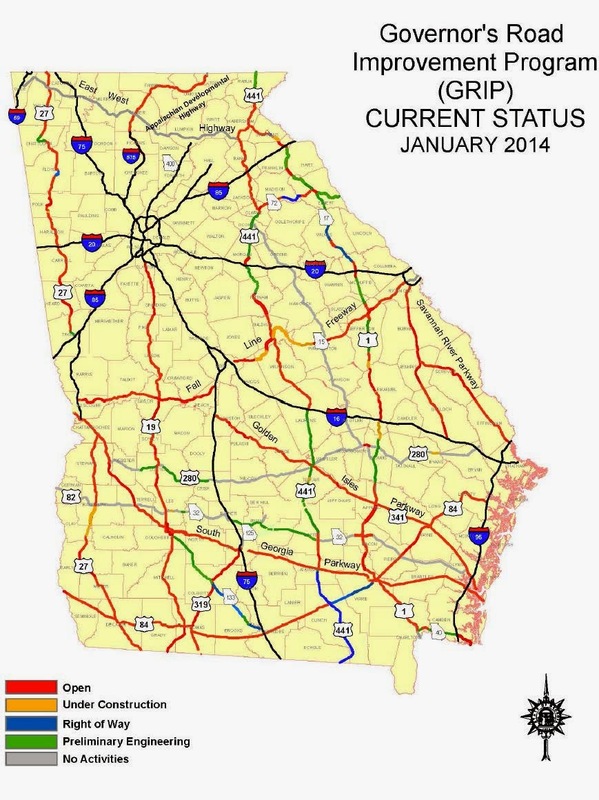 If the project is approved again by the Policy Committee on April 8, the Georgia Department of Transportation has promised to provide $1 million for preliminary engineering in the current fiscal year for the roadway. The U.S. 441 widening and Bishop bypass were an element of a somewhat contentious meeting of the county’s Citizen Advisory Committee for Land Use and Transportation Planning last night at the Community Center in Veterans Park. The Committee defeated by a 5-4 vote a motion to tell the Board of Commissioners that the Committee considered the construction of a multi-grade intersection at SR 316 and the Oconee Connector a higher priority than widening of U.S. 441 and construction of the Bishop bypass. The video below starts with County Public Works Director Emil Beshara explaining the changes made officially by the MACORTS Policy Committee this morning. Cofer, wearing a green shirt, has his back to the camera. The Land Use Committee spent most of the hour it sets aside for its meeting trying to figure out what its goals were as it struggled to create a priority ranking of projects the county has before MACORTS. That discussion ended without a clear resolution of the issue. As part of that discussion, Oconee County Public Works Director Emil Beshara updated the group on the U.S. 441 widening project. Cofer, who owns a garden store in Athens-Clarke County but lives in Oconee County, offered his comments on the Bishop bypass at that time. At a later point in the meeting, Bob Isaac offered his motion that instructed the Board of Commissioners to move the SR 316 interchange ahead of the U.S. 441 widening project. Joining Isaac in the vote were Maria Caudill, Courtney Gale and Cofer. Warren, Bob Sanders, Bill Tolner and Jim Butler voted against, and Committee Chairman Abe Abouhamdan broke the tie by voting against the resolution. The MACORTS Policy Committee, meeting in a 15-minute session at the Athens-Clarke County Planning Department this morning, officially approved an amendment to the FY2015-2018 Transportation Improvement Program for the urbanized parts of the three counties. The Transportation Improvement Program had been approved in September of last year and did not include the U.S. 441 project. Instead, the U.S. 441 widening and bypass were part of the 2040 Long Range Transportation Plan, approved by MACORTS in October of last year. The change in the Transportation Improvement Program would include the $1 million of funding for preliminary engineering in the current fiscal year but would leave right of way and construction designated as long range. The Policy Committee cannot finalize action on the changes in the Transportation Improvement Program until after the public is given a chance to comment. The MACORTS action is required because $800,000 of the preliminary engineering funding will come from the federal government. The remainder will come from the state. The county is not obligated to provide any of the preliminary engineering funds. MACORTS is one of 16 federally-mandated metropolitan planning organizations in Georgia. All federal transportation funds for the urbanized area made up of all of Athens-Clarke County, the northern half of Oconee County, and the southernmost part of Madison County must pass through MACORTS. Starting in 2013, small portions of Oglethorpe and Jackson counties were designated as urban areas based on population data, but those two counties have chosen not to participate in the MACORTS planning process. Oconee County is represented on the MACORTS Policy Committee by Oconee County Board of Commissioners Chairman Melvin Davis and Sanders from the county’s Land Use and Transportation Planning Committee. Both attended the meeting today. Radney Simpson from the GDOT Office of Planning in Atlanta sent Sherry McDuffie, MACORTS transportation planner, an email message on Jan. 12 of this year asking her to amend the existing Transportation Improvement Program to include the U.S. 441 widening and Bishop bypass. MACORTS initiated action on the request on Jan. 28, when the Technical Coordinating Committee approved the draft amendment to the Transportation Improvement Program and sent it to the Policy Committee for today’s action. The southern part of the county is not designated as urbanized, and MACORTS’ jurisdiction ends at SR 186 (High Shoals Road), north of Bishop. McDuffie told me today that the whole widening project, including the bypass, is lumped together as one project by GDOT because SR 186 would not be a “logical terminus” for the roadwork. In the 2040 Long Range Transportation Plan, the whole project is estimated to cost $66.5 million, with $13.3 million of that for the portion of the roadway that is from Watkinsville to High Shoals Road. The document does not divide up costs among the federal, state and local governments. McDuffie told me that GDOT is pushing the widening of U.S. 441 because the highway is part of the Governor’s Road Improvement Program and because it is considered to be a major freight corridor for the state. U.S. 441 runs from the Florida border to the North Carolina border and will be a major route to move cargo unloaded in the deepened Savannah Port. The Oconee County section of U.S. 441 is one of only a few in the state that is not already four lanes wide, McDuffie said. Beshara told the Land Use Committee last night that more than a dozen routes for the bypass had been proposed in the past. McDuffie said that GDOT “is starting over” in the search for an appropriate route. Until the project is back in the MACORTS Transportation Improvement Program, the state cannot start work on the design. The public will not be looking at any proposed design at the information meeting on Feb. 24, McDuffie said. It only will be looking at the proposed change in the Transportation Improvement Program moving the time line for preliminary engineering forward. MACORTS will take public comment on the change in the Transportation Improvement Program from Feb. 23 to March 9. It voted to approve without any discussion. The presentation and vote took only 90 minutes. I was not able to attend the meeting, but Russ Page did. Page recorded the video below. As the video starts, Athens-Clarke County Mayor Nancy Denson is seated at the table, with Oconee County BOC Chairman Davis on her right. Denson is chair of the Policy Committee. Aren't we glad Stuart Cofer is leading the committee? What a stupid remark. My remark was to prove a point that to spend 66 million dollars for a small bypass that traffic is really not bottle necked in Bishop is not needed now but that building an over pass at the Hwy 316 interchange with the Oconee Connector for 25 million is a better use of tax payers money....come to our meetings if you want to hear what we really say and not what is cut out by this blog. The point I was making is that to spend taxpayers money to the tune of 66 million dollars to bypass a very small town with historic buildings was not needed at this time since traffic does not bottle neck going thru Bishop. A better use would be to spend 25 million on an overpass at the Hwy 316 and Oconee Connector interchange which is and will be a bottle neck in the near future. I invite you to attend our meetings and hear what we really say and mean and not just the short snip its in this blog. You could literally move every building in Bishop that has historic value a lot cheaper then spending 66 million to go around it.....plus those business in Bishop will see the current traffic flow gone and their business hurt by it. Why is there a long-term MACORTS plan, when Melvin Davis and realtor/State Transportation Board member Jamie Boswell can move around project timelines behing closed doors, with absolutely no public transparency. Time for a Freedom of Information act on all coorespondence between Melvin, Jamie and deep pocketed developer Frank Bishop. Anyone who says "traffic does not bottleneck through Bishop" obviously does not drive 441 very often! This has been put off too long already. The citizens of South Oconee need the bypass built yesterday! I want to thank you for posting this. After reading the comments from some of the board members I am very disturbed that they would make the comments they did especially the disturbing comment about burning the town and our homes down. This project has been discussed for over 20 years and is needed more now than ever before. I think those board members making such comments should resign their positions on the board and be replaced with someone that can look at the projects that benefit the State best. 441 has by-passed all Towns in it's path except Bishop. I drive through Bishop daily and multiple times per day. Traffic does NOT back up through Bishop. Yes, when cars are turning by Golden Pantry, it is occasionally a hassle, but it doesn't even come close to qualifying as "traffic". Those of us who live in Bishop would be glad to have any of the committee members spend a day with us and be educated and understand the problem with U.S. 441 through downtown. Comments from some show a complete lack of understanding and/or concern for people. They talk about buildings, but not the citizens. Buy it and burn it indeed. How tacky was that. 66 million dollars for the infrequent "bottleneck" with miles of twisty two-lane to the river? Are they talking about widening the actual stretch of 441 that goes through Bishop? Or just a bypass around Bishop? I'm new to the area and I am trying to get a understanding. The plan is to leave U.S. 441 as two lanes through Bishop and build a bypass of the city.